If you’re an agent or broker looking for marketing ideas on how to supercharge your real estate business in 2018, you are not alone. Actionable real estate marketing strategies are in short supply, and there’s always plenty of jostling from real estate brokers looking to get a leg up on the competition. Experts are using a mixture of creativity combined with technology to get the most out of their marketing dollars. A few examples from our gurus of real estate will help you do the same. 1. Find keywords to send traffic to your site organically. We know, digital marketing can be an intimidating prospect for traditional real estate agents, but in the internet age, people are using sites like Google and Bing more with each passing year. In a 2017 report, the National Association of Realtors Research Development discovered that 44 percent of home buyers looked for properties online first. Newspaper ads only covered 22 percent. Putting simple, relevant keywords in your website copy is fast, easy, and free – unlike putting ads in your local newspaper. 2. Speaking of websites, have one that works. There’s nothing more frustrating for a prospective homebuyer than locating a real estate agent’s website, pressing the call button, and having the site crash. Make sure your website has actionable buttons, working URLs, and responsive navigation throughout. 3. Two words: vehicle wraps! Garish, yes. Effective, absolutely. Vehicle wraps combine the effectiveness of a billboard sign with the targeting of traditional signage, because you can drive around the neighborhoods you want to target.Chances are, you already have a vehicle at home or at the office, just waiting to be used as rocket fuel for your marketing engine. 4. Try to bring your number of LinkedIn connections up. LinkedIn serves as a public directory in most cases, and people looking for properties may look at a broker’s page to see how popular they are, or what kind of content they’re offering up. Connectedness within the industry, along with sponsored posts, increase your credibility. 5. Create a blog that addresses potential homebuyers. Quality content ranks your site in search engines, but it can also guide your possible clients through moments of confusion in the homebuying process. The sooner you address their concerns, the quicker you’ll build up rapport that can lead to a sale further down the line. 6. Follow up with clients. This should be a no-brainer to most in the real estate industry, but few actually examine how often they’re keeping in touch with past buyers. You never know when clients might sell and re-buy, or start thinking of a second property to purchase. An email newsletter is a good way to stay in touch, along with the occasional voicemail. 7. Vinyl and cloth banners can be life-savers. Looking for versatility? Vinyl and cloth banners be hung anywhere – churchyards, storefronts, street sides, you name it. Cheap and weather-resistant, these custom banners can grab the attention of any passing motorist or pedestrian. Since they’re not bound to traditional advertising spaces like bus stops and newspaper ads, homebuyers have a hard time ignoring them. 8. Gather your client testimonials into a document. Third-party accounts address potential what-ifs, earning the trust and respect of prospective property owners. Placing all your testimonials into a single packet can calm any last-second doubts at the crucial point of signing a contract. 9. Post on social media regularly. Who isn’t on Facebook nowadays? If you’re looking to reach the broadest audience possible, post your content (blogs, listings, testimonials) on your Facebook page. It’s one of the few social media platforms that bring boomers, millennials, and Gen-X together, so a large cross-section of possible clients can start up a conversation, right from your posts. 10. Fit referrals into your marketing budget. While 89% of real estate agents find referrals to be the most successful marketing tactic, many don’t spend money at all attaining them. Set up a newsletter that asks past clients to recommend family and friends or even schedule a personal call. 11. 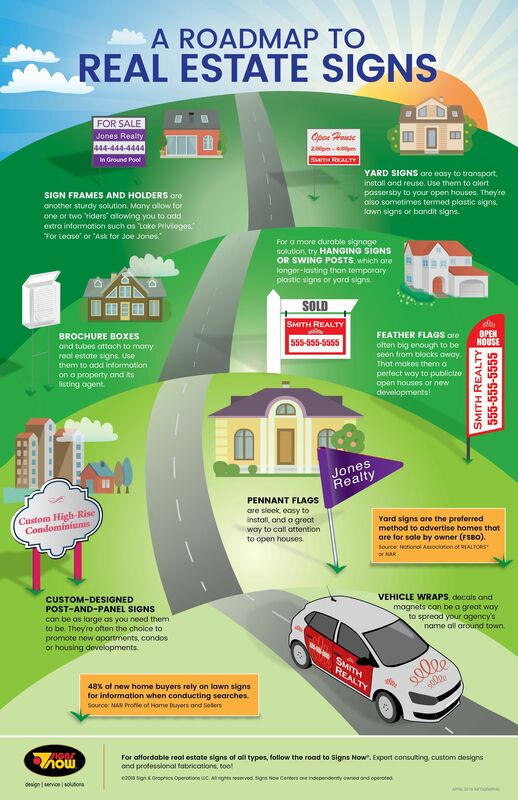 Post and panel signs can let people know a property is on the market. When passing by a property or home that catches their eye, the first thing a potential buyer looks for is a “for sale” sign, and a phone number for the agent. Give off a respectable first impression with a custom-designed, post and panel sign that will stick in future clients’ minds. 12. Don’t leave the windows of your office blank. Any space that you own can be used as an advertising beacon, and windows are no exception. Window graphics take advantage of natural light, look elegant, and convey important contact information. Give passerby something to look at – they might find that they’re suddenly overtaken with the desire to buy that home they were looking at last week. 13. Create infographics that are shareable. Infographics are an appealing way of presenting hard-to-read data. Trulia and Zillow both have a variety of metrics that you can post to Facebook or Pinterest, which should interest potential buyers in your area. With all hope, your infographic will go viral –at least locally. 14. Add a virtual tour of your listed properties. Scheduled viewings are great, but they’re not an effective way of winnowing out people who are just window shopping. Take advantage of 2018’s fast internet connection speeds and give buyers an opportunity to know what they’re getting themselves into – before they take up valuable scheduling time. 15. Tell a story in each of your listings. Even if you’re not the most eloquent writer, take those creative muscles you haven't exercised since high school and start plugging away at a keyboard. Stories add an unmatched sense of history and humanity to a property, captivating potential clients. 16. Make sure your listing photos are attractive. All the digital marketing in the world won’t help a listing with bad photos. If the resolution of images is too high, your website will take forever to load. Loose furniture, toys, and materials for renovation are best left off your listing until you have time to clean up the property. 17. Heard of Google Adwords? We hope so. Every second, Google processes 40,000 search queries. Don’t believe us? Google it. Harnessing that amount of traffic for any local business is crucial; for real estate brokers, it’s a must. Adwords leads are almost always high-intent, and ready to buy. 18. Don’t want a full vehicle wrap? Lettering works too. Compared to other forms of outdoor advertising, vehicle graphics and lettering is one of the most economical. Prospective buyers can still catch a glimpse of a vehicle with your contact information around the clock, and in the most unlikely of places. 19. Create a video tour of your neighborhood. If you’re in an up-and-coming neighborhood undergoing a renaissance, let buyers know how they’ll fit in to the new paradigm. Recording a tour of the surrounding neighborhood can dispel misconceived notions, while still getting likes and shares on social media. For real estate signs that’ll spark up your marketing strategy, rely on the experts at Signs Now®. “How else can signs and banners improve my real estate marketing?” you ask. Find out with an expert site assessment courtesy of Signs Now®. We have an array of Real Estate Signs for all applications and budgets. And if you’re looking for a low-cost solution to spur calls from homebuyers, we offer Plastic Signs & Yard Signs. We invite you to learn more about what Signs Now® can do for you. To get started, contact us today.